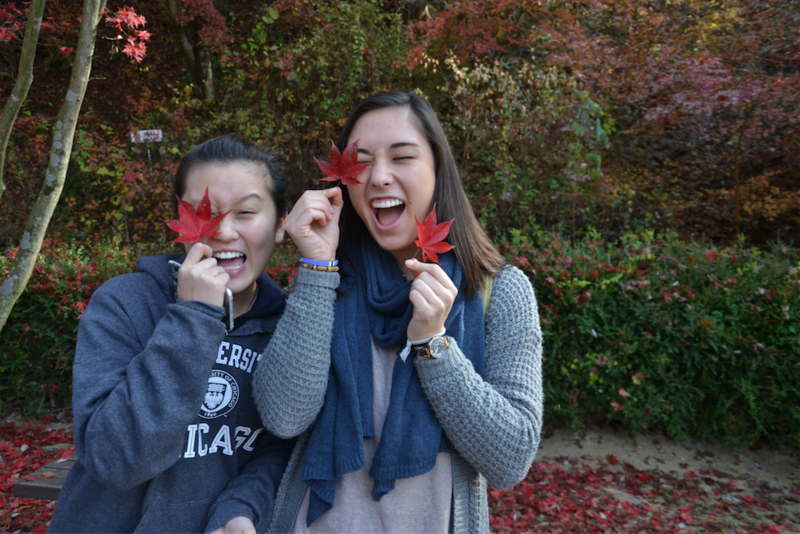 Each month, the NSLI-Y program takes us on a “cultural enhancement excursion” to experience various aspects of Korean culture and help us think in new ways. These trips are always some of my favorite times of the month and each one has been unique and insightful. 토요일 아침에 좀 일찍 일어났어요. 이 여행이 정말 재미있었어요! 주말 동안 역사와 문화 배웠어요. 버스로 적어도 4시간 걸리는데 모두 NSLI-Y 친구랑 같이 좋은 시간을 보냈어요. 버스를 타는 동안 빵을 먹고 책을 읽고 이야기했어요. 2시간 쭘 후에 대부분 사림 낮잠을 잤어요. 도착했을 때 첨심를 많이 했어요. 생선과 밥과 판전을 먹었어요. 먹운 후에 안동 한옥 마울에 갔어요. 우리 안내사는 아주 재미있어요. 안내사는 안동의 역사를 우리한테 가르첬어요. 관광 후에 전통 그네 봤어요. 첫번째 학생부터 마지막 학생까지 진행방향을 바궜어요. 정말 좋아요. 저는 도시 좀 안 좋아해서 시골 아주 좋아요. 서울에 도착 안 하고 싶어요! 저녁에 전통 시장에 갔어요. 사실 시장들이 정말 좋아요. 시장에 갔는데 한국어 연습을 해서 좋았고 엄마와 여동생의 선 물을 샀어요. 저는 애쁜 선물 골랐어요. 저녁 6시쯤에 침딹을 먹으려고 식당에 갔어요. 침딹이 아주 아주 좋아요!! 좀 매웠지만 달았어서 정말 맛있었어요. 많이 먹은 후에 얘쁜 다리에 갔어요. 화려한 불 많이 있고 분위기 편화로워요. 사진을 많이 찍었어요. 마지막으로 한옥 마울에 도착했어요. 마울에서 묵었고 온돌의에 잤어요. 날이 바쁜데 좋아요. Translation: Saturday morning I woke up somewhat early. I was really excited for this trip! Over the weekend we learned about history and culture. Although it would take about 4 hours to get to Andong, the NSLI-Y students always have a fun time together. While on the bus we snacked on bread, read books, hung out and talked. After about 2 hours most of us took a nap. When we arrived we had a large meal. We ate fish, rice, and Korean traditional side dishes. 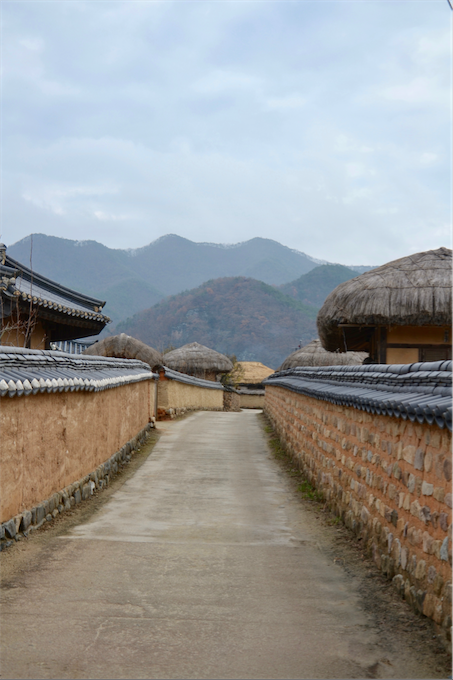 After we ate we went to Andong traditional village for a tour. I really liked our tour guide. She taught us about Andong’s history. After touring the village we found a traditional swing. One at a time we took turns using the swing. It was really fun. Since I don’t really like the city very much, I really enjoyed the countryside. I didn’t even want to return to Seoul! In the evening we went to a market. I really enjoy going to Korean markets. While at the market I really enjoyed practicing speaking Korean and while there I also bought some small presents for my mom and younger sister. Around 6pm we went to a restaurant to eat a dish called 침딹 (chicken). I REALLY liked this dish! It was especially tasty because it was a little spicy and a little sweet. After we ate a lot we went to a pretty walking bridge. There were many colorful lights and the atmosphere was peaceful. We took lots of pictures here. Finally we went back to the village and slept in a traditional house. The day was busy but very fun. My favorite part of the trip was thinking about the effects of Confucianism on modern education and society. It was interesting to think about how the Confucian mentality of working hard and being qualified for your job so strongly impacts the way Koreans view the purpose of education today. While many Korean students score in the top rankings of standardized test scores, their high academic achievements come at a price. Many students I’ve spoke with dislike their school system and want to someday leave Korea. They feel consumed with stress and know that they won’t be able to get a solid job in Korea if they don’t perform well academically and get into the top universities. The system is incredibly competitive and forces students to even be stacked against one another for grades and ranking. Some have told me that even if they get into one of the top Korean universities and get to work for a large corporation in the future, their general happiness of life may not be very high because of all the stress they will face. Compared to the U.S., schools in Korea are much more focused solely on academics. Colleges often don’t even consider your club participation or work experience: they just want to know your test scores. While this emphasis on academics has produced some of the top ranking students in the world, many students also feel they may be ill-equipped to face general social and life situations due to their lack of exposure to the world outside the classroom. Contrastingly, most schools in the U.S. focus on a “well-rounded” education and emphasize being involved in student leadership, clubs, sports, and even part-time work. While I am personally very thankful for my experiences outside the classroom and feel incredibly influenced by the hobbies I’ve developed, I have to admit that for some students in America these extracurriculars can become a distraction from academics and may result in the generally lower average on standardized tests as compared to other parts of the world like South Korea. Pros and cons certainly exist on both sides of the spectrum, and after analyzing other school systems such as Finland and Germany, we agreed that different systems work for different regions and it would be incredibly hard if not impossible to create a system that would work for everyone. Although some Korean students may dislike their school system, I have to admit that I am very impressed by many aspects of it and think that the United States’ education system could be positively impacted by some of their models. For example, their work ethic is nearly unparalleled to any other group of students I’ve interacted with. I’m constantly impressed by their dedication and ability to maintain a positive attitude while doing so. Likewise, teachers in Korea are paid nearly the same as doctors, showing the emphasis Korea places on education. Since students will someday be the next generation of leaders, I believe that teachers should be valued more in the United States: motivated teachers often result in motivated students. One of the best things I learned from being homeschooled for 9 years was to develop a love of learning. More than anything else, this is what will transform school systems in both America and around the world. When we start appreciating knowledge and recognizing that every day is an opportunity to learn, we will begin to diminish apathy, embrace activism, and lead in innovation.